Accessing the internet has proved difficult the past few days but, for now, I have access. The past few days have been spent visiting the spots that most tourists see while in Beijing and for good reason. 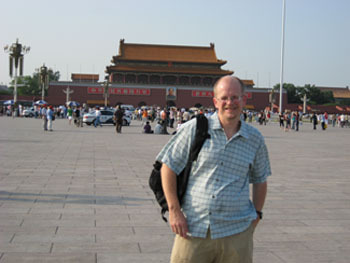 Saturday we went to the Temple of Heaven, Tiananmen Square, and the Forbidden City. The weather was not the best on Saturday and we battled continual light rain and occasional downpours as we toured these famous spots. We walked through Tiananmen in what seemed like a monsoon with water swirling several inches above our feet. Needless to say we did not pause to examine this mammoth square. We were saved slightly by the ominipresent Beijing vendors who had an endless supply of $1 umbrellas. I was comforted knowing I would return in about a month after the Fulbright program is over for another visit. In fact, we did return to Tiananmen on Sunday to capture a couple of snapshots (the weather had improved considerably – see below). On Sunday we went to place everyone associates with China – the Great Wall. The weather was perfect, skies blue and not too hot temps. The drive was suprising as it again revealed the extent of greater Beijing. We passed the Olympic stadium which was magnificent. Time will not allow a complete description of the Great Wall experience but let’s just say it lived up to its billing. My roommate Jeff and I defied warnings about attempting to climb up to the wall (most took a cable car or chair lift) and walked up countless flights of stairs. It wasn’t bad though thanks to my running and we made it. The views were amazing from the Mutianyu section of the Wall and we took time to explore about and down this famous structure. 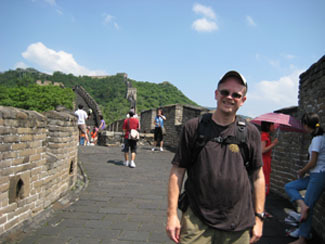 Below is the obligatory Great Wall snapshot. Again, I look forward to returning. Sunday ended with a visit to the Peking Opera (a bit touristy but cool). Tomorrow and the days following mark a return to lectures and study as we visit Beijing Normal University and the City Museum.